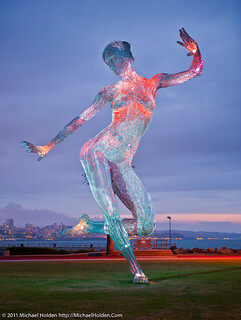 One of the problems I encountered while photographing the Bliss Dance on Treasure Island is one of rust. The sculpture has orange brown rust stains dripping on the mesh skin. Thankfully, while there I took a Hi Key style photo against the late afternoon sky. I shot in RAW so I was able to change the white balance in post to tungsten. It gives her a pale blue glow. Working with a sculpture is quite nice, I must add. It will always hold the same pose and not wander off to climb a tree or something. No squirrels were evicted during the making of this photo. Still, a Hi Key Bliss in daylight is nothing compared to the working light show at night. I can't find any up to date news on the renovation that's less than a year old. I would very much like to return at night and see her lit up.